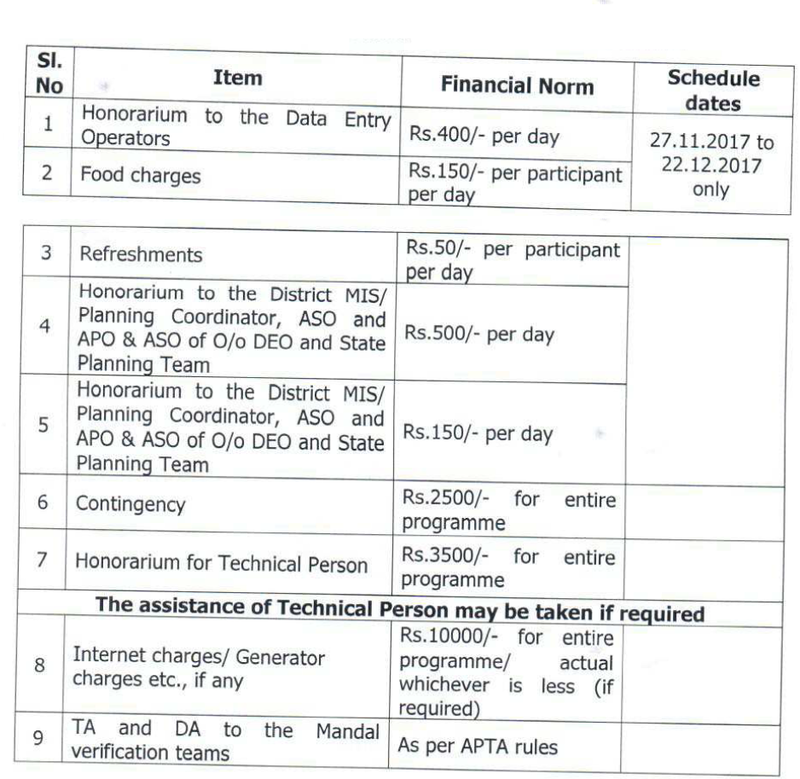 Sub: APSSA, CSE- Amaravati - Collection of U-DISE Data for the year 2017-18 - conduct of Data Entry & Data Consistency - Revised order communication of guidelines and Financial norms - Constitution of State/District level teams- Reg. In continuation to this office proceeding, all the District Educational Officers and Project Officers of SSA in the state are informed that, the Schedule for U-DISE 2017-18 Data entry and Data Consistency checking at district level has commenced from 09.11.2017. 3. It shall be ensured that both Data Entry Operator & Mandal MIS Coordinator has to complete data entry within a stipulated time. 4. At the time of data entry work at Mandal level the concerned school Head Master/ CRP should be present. 5. The budget may be utilized for primary/upper primary from SSA funds and high schools/higher secondary/Jr.Colleges from RMSA funds. If plan budget is not sufficient under AWP&B 2017-18 the budget from Management cost may be utilized. The District Educational Officers and Project Officers of SSA are informed that the Regional Team will visit the districts from 01.12.2017 to 31.12.2017 to monitor the UDISE 2017-18 programme in the State. The Project Officers are requested to provide a car available in the DPOs to the observers during their visit in the district and are also requested to provide a suitable accommodation to the visiting team. The District Educational Officers and Project Officers of SSA are informed that the APOs/ ASOs/ MIS Coordinators of DPO office and ASOs of DEC office are nominated as District Nodal Officers to monitor the UDISE programme in their respective districts. The Project Officers are further requested to meet the expenditure from the intervention of U-DISE 2017-18. Further they are requested to provide the necessary transportation to the District Nodal Officers and also involve all the staff of DPO office by duly assigning the Mandals to monitor the day to day progress till completion of UDISE 20 17-18 and also they are further requested to submit the daily report to District Level Committee. The District Educational Officers and Project Officers of SSA should coordinate with each other for completion of UDISE in their district in smooth manner to complete the process as per the schedule and for any assistance on implementation of the project they may contact technical team help desk (APOnline) through RTS/Email/Landline. The Project officers are further permitted to get the Data capture Formats (DCF) printed at the district level itself and meet the expenditure from DPO Management cost. In view of the above, all the District Educational Officers and Project Officers of SSA are requested to follow the above guidelines and financial norms and instructions towards Data Entry and data Consistency checking of U-DISE and ensure completion of data entry as per the schedule without any delay.